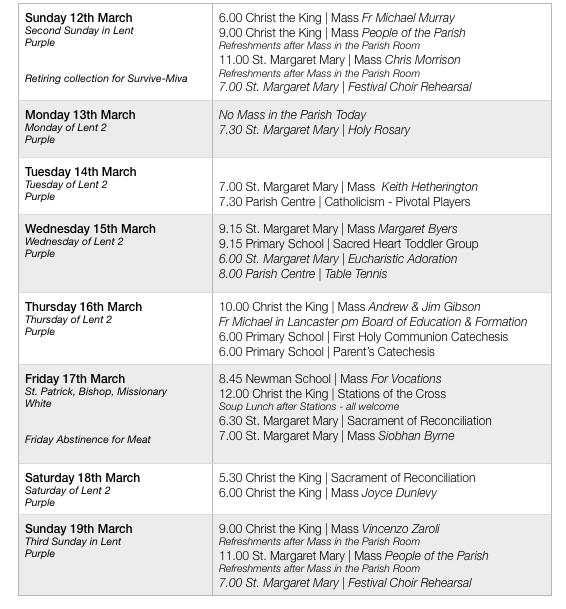 Please note the time and place for the Sunday morning Mass for Palm Sunday. 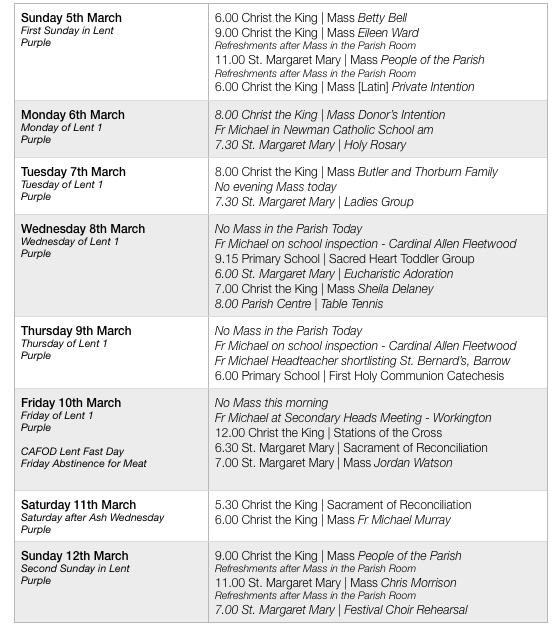 As previously advertised, there will be one Mass in the parish at Christ the King at 10.00 am. The vigil Mass is the usual time. If transport is needed, please see Fr Michael. Exploring Holy Week: “He set his face to go to Jerusalem” [Luke 9:51] at St. Margaret Mary on Saturday 8th April from 10.30 am until 3.00 pm. Tea/Coffee will be provided. Bring a packed lunch. Please consider coming along. In February we will have a new opportunity to learn more about our faith using Bishop Robert Barron’s Catholicism series. Bishop Barron is on a new journey to unlock the truth behind the Catholic Church's most influential people. CATHOLICISM: The Pivotal Players is a multi-part film series that illumines a handful of saints, artists, mystics and scholars who not only shaped the life of the Church but changed the course of civilisation. The series will be held fortnightly on Tuesday evenings in the Parish Centre after Mass. Optional personal study material will be available via email. The next gathering will be this Tuesday, 11th April when we’ll consider GK Chesterton. We’re hoping to send two teenagers to Lourdes with the Diocesan Pilgrimage in July. This will cost around £1500. There will be a Craft and Cake Sale next Sunday after the two Masses. Please support. Thank you for your contribution of £452.50 + £215.71 = £668.21. There were 72 + 73 + 88 = 233 at Mass last weekend. Catechesis takes play at St. Margaret Mary Catholic Primary School at 6.00 pm. The next session will be on Thursday 27th April. The session for parents, cancelled last week due to school events, will be on Thursday 27th April. Application forms are available for young people [Year 6 and above] to apply for this sacrament. Please return to Fr Michael as soon as possible. Once numbers are known, we will apply to the bishop for a date for the celebration and begin preparation. We meet each Sunday at 7.00 pm at St Margaret Mary. We would really welcome new members. If a parishioner, who is a tax payer, would like to join the scheme, please contact Judith Clifford on 526781 for Christ the King or Richard Reardon on 544737 for St. Margaret Mary. If you have ceased paying tax and are part of the scheme, please notify the organisers or if are unsure if you have paid the tax you are reclaiming. 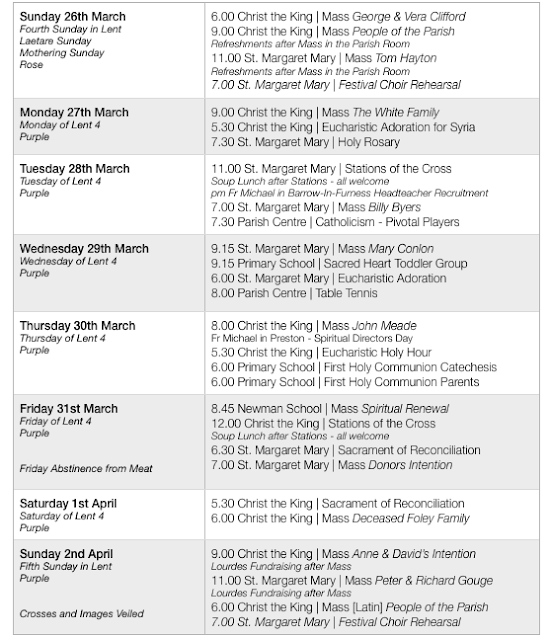 Could all Readers and Ministers please let us know their availability during the celebration of the Triduum. Sign up sheets will be available at the back of each church. Meet on Tuesday evening at St. Margaret Mary’s for fun and games. New members always welcome. As the academic year continues with an Easter break, we wish all our teachers a well earned rest from their labours. Thank you for your professionalism and work during the last term. Holy Mass on Wednesday morning will be a whole-school Mass to mark the end of term. Why not come along? Thank you for your contribution of £447.20 + £312.45 = £759.65. There were 66 + 64 + 115 = 245 at Mass last weekend. Catechesis takes play at St. Margaret Mary Catholic Primary School at 6.00 pm. The first session for parents will be on this Thursday 30th March. Jerusalem” [Luke 9:51]. On Saturday 8th April at St. Margaret Mary from 10.30 am to 3.00 pm. Tea/Coffee will be provided. Bring a packed lunch. Please consider coming along. Envelopes for the next financial year will be available shortly for those parishioners who are members of the scheme. Standing order donors do not need to take any further action unless they wish to increase their contribution. If a parishioner, who is a tax payer, would like to join the scheme, please contact Judith Clifford on 526781 for Christ the King or Richard Reardon on 544737 for St. Margaret Mary. If you have ceased paying tax and are part of the scheme, please notify the organisers. Please consider giving via the Gift Aid scheme - it increases your donation without any additional cost to yourself. This organisation of ex-service people seeks to educate the wider public about military life, militarism and foreign policy from an experienced point of view. You can find more about them here: www.vpfuk.org. Their founder, Ben Griffin, is going to give a talk on Tuesday 28 March at 7.30 pm at Carlisle Quaker Meeting House. Q&A session afterwards, tea & biscuits provided. All welcome. Tickets free, but it would help if you book in advance. Our diocesan residential youth centre, Castlerigg Manor, Keswick, invites you to join in their Family Weekend: 28-30 April. For more information, visit www.castleriggmanor.co.uk, e-mail: team@castleriggmanor.co.uk or phone the team on 017687-72711. There will be a celebration for the people of Carlisle & West Cumbria to give thanks for the kindness and skills of staff & volunteers at their local hospitals on Monday 27 March from 4.00-6.00 pm at Carlisle Cathedral. Share refreshments, hear the cathedral choristers, and express your thanks. All welcome. In February we will have a new opportunity to learn more about our faith using Bishop Robert Barron’s Catholicism series. Bishop Barron is on a new journey to unlock the truth behind the Catholic Church's most influential people. CATHOLICISM: The Pivotal Players is a multi-part film series that illumines a handful of saints, artists, mystics, and scholars who not only shaped the life of the Church but changed the course of civilisation. The series will be held fortnightly on Tuesday evenings in the Parish Centre after Mass. Optional personal study material will be available via email. The next gathering will be this Tuesday, 28th when we’ll consider Bl. John Henry Newman. Thank you for your contribution of £421.44 + £229.82 = £651.26. There were 72 + 81 + 105 = 258 at Mass last weekend. Catechesis takes play at St. Margaret Mary Catholic Primary School at 6.00 pm. The first session for parents will be on Thursday 30th March. Eucharistic Adoration will resume at Christ the King on Thursday evening this week. Our Lady and St. Joseph’s are running a bus to the Chrism Mass at our Cathedral in Lancaster on Maundy Thursday (13th April). This will leave OLSJ at 9.30 am and return at 3.00 pm. Cost £10. Sign up sheet at the back of church at OLSJ or email: ourladyofeden@gmail.com Closing date 9th April. Jerusalem” [Luke 9:51]. 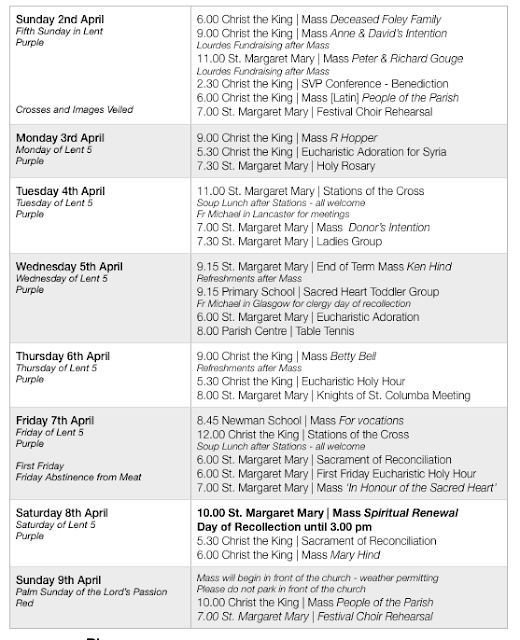 On Saturday 9th April at St. Margaret Mary - beginning at 10.30 am, concluding at 3.00 pm. Tea/Coffee will be provided. Bring a packed lunch. Please consider coming along. This organisation of ex-service people seeks to educate the wider public about military life, militarism and foreign policy from an experienced point of view. You can find out more about them here: www.vpfuk.org. Their founder, Ben Griffin, is going to give a talk, Tuesday 28 March at 7.30 pm in the Carlisle Quaker Meeting House. Q&A session afterwards and tea & biscuits provided. All welcome. Tickets free, but it would help if you book in advance. Our diocesan residential youth centre, Castlerigg Manor, Keswick, invites you to join in their Family Weekend: 28-30 April. For more information, visit www.castleriggmanor.co.uk, e-mail team@castleriggmanor.co.uk or phone the team on 017687 72711. There will be a celebration for the people of Carlisle & West Cumbria to give thanks for the kindness and skills of staff & volunteers at their local hospitals on Monday 27 March, 4.00-6.00 pm at Carlisle Cathedral. Share refreshments, hear the cathedral choristers, express your thanks. All welcome. All are welcome on the first Friday of the month. Next one - Friday 7 April from 8.00-9.30 pm at St Gabriel’s convent chapel, 52 Victoria Place, Carlisle CA1 1HP. For more information, please contact Monica at greaves_monica@yahoo.co.uk. In February we will have a new opportunity to learn more about our faith using Bishop Robert Barron’s Catholicism series. Bishop Barron is on a new journey to unlock the truth behind the Catholic Church's most influential people. CATHOLICISM: The Pivotal Players is a multi-part film series that illumines a handful of saints, artists, mystics, and scholars who not only shaped the life of the Church but changed the course of civilisation. The series will be held fortnightly on Tuesday evenings in the Parish Centre after Mass. Optional personal study material will be available via email. The next gathering will be this Tuesday, 14th when we’ll consider St. Catherine of Sienna. Figures were not available at the time of publication this week. Catechesis takes place at St. Margaret Mary Catholic Primary School at 6.00 pm. The first session for parents will be on Thursday 16th March. The parish has a page on Facebook which offers useful resources for parishioners as well as information about parish events: @SacredHeartCarlisle - why not ‘Like’ it? Jenny Baker, Andrew Fava and Niklas Carlsson will lead this weekend of inspirational teaching, praise, and ministry. Donation only. For information, please call 016973 45623, visit www.coretlumenchristi.org or e-mail stcuthberts@coretlumenchristi.org. 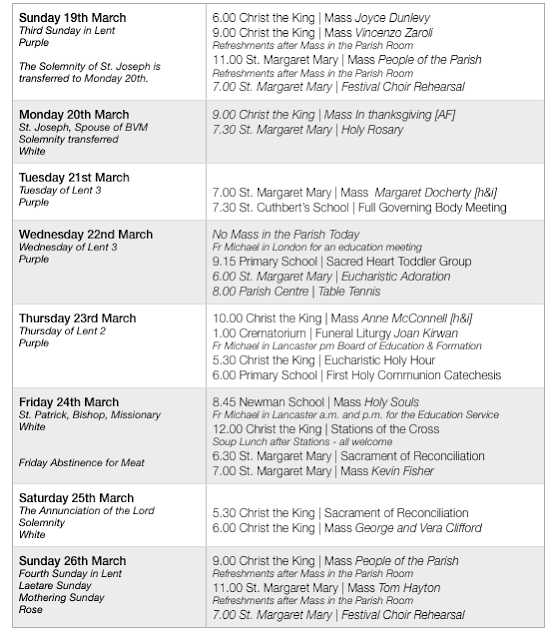 Fr Norman Johnson will be supplying in the parish this weekend 11th/12th March. He’ll be making an appeal on behalf of Survive-Miva, which is a Catholic lay Association. They exist to provide one vital element for the success of the Church's health and pastoral work in areas of great need - a means of transport. Our Lady and St. Joseph’s are running a bus to the Chrism Mass at our Cathedral in Lancaster on Maundy Thursday (13th April). This will leave OLSJ at 9.30 am and return at 3.00 pm. Cost £10. Sign up sheet at the back of OLSJ church or email: ourladyofeden@gmail.com. Closing date 9th April. Exploring Holy Week: “He set his face to go to Jerusalem” [Luke 9:51]. On Saturday 9th April at St. Margaret Mary. Commences 10.30 am and concludes 3.00 pm. Tea/Coffee will be provided. Bring a packed lunch. Please consider coming along. Many thanks to Paul Daley who has assisted the parish over many years helping organise the Gift Aid scheme at Christ the King. Paul has announced his retirement from the world of envelopes and I’m grateful that he has spent time headhunting an able replacement. This organisation of ex-service people seeks to educate the wider public about military life, militarism and foreign policy from an experienced point of view. You can find more about them at www.vpfuk.org. Their founder, Ben Griffin, is going to give a talk, Tuesday 28 March at 7.30 pm in Carlisle Quaker Meeting House. Q&A session afterwards and tea & biscuits provided. All welcome. Tickets free but it would help if you could please book in advance.